Short wig is not only charged with affordable price, but is easy to pull off. This short Annesophia cosplay wig keeps slightly curly style, saving your time every morning to style your hair. Brown color wig is very handy for office ladies not only because its natural color and soft fabric but also because it’s easy to care. Some girls are often been troubled by the shine in some wigs, to reduce the shine, sprinkle baby powder on to your wig and brush through for an even spread out of the baby powder. When wearing wig, whisk it gently. Let the air pass through the fibers for a gentle puff. You can surely get a more amazing wig with the color you love! 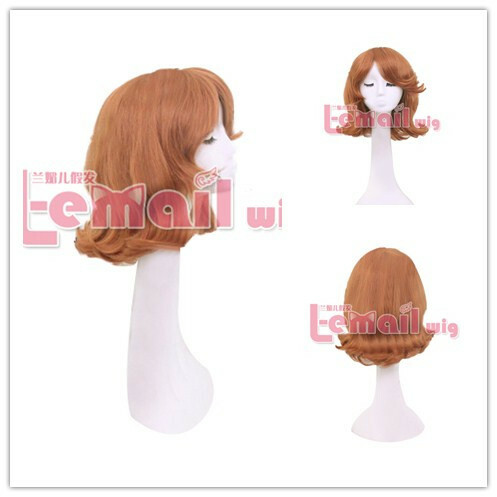 This entry was posted in Buy Cosplay Wigs, Wig Maintenance and Care and tagged 35cm wave cosplay wig, cheap cosplay wigs, light brown cosplay wig, short curly wigs.